Stocks of sugar companies have risen 53% in the one year to August. Between 2008 and 2013, they had fallen 16.47% on an average every year. The biggest gainer, DCM Shriram Industries, has risen 306.78% to Rs 120 in the last one year. It is followed by KM Sugar Mills (274.51% to Rs 3.82), Dwarikesh Sugar Industries (148.33% to Rs 37.25), Triveni Engineering & Industries (109.59% to Rs 23.60) and Balrampur Chini Mills (100.14% to Rs 71.65). "Sugar stocks have rallied due to the recent increase in import duty and hope that the sector will be deregulated. The industry expects that the recommendations of the Rangarajan Committee, which has suggested that cane prices should be 75% of sugar prices, much less than the current price of Rs 210 per quintal, will be implemented. This will ensure that sugar companies again start making profits at the operating level," says Vikram Dhawan, director, Equentis Capital, a Mumbai-based financial services firm. Sugar is among the very few sectors where the government is involved at every stage, right from fixing the price that mills have to pay farmers for sugarcane to tweaking the various tax rates for price stability. Standoffs over cane pricing between farmers and state governments on the one side and mills on the other are common. The mills complain that while the government sets a fixed price for cane, the price of sugar is determined by market forces, leading to losses. 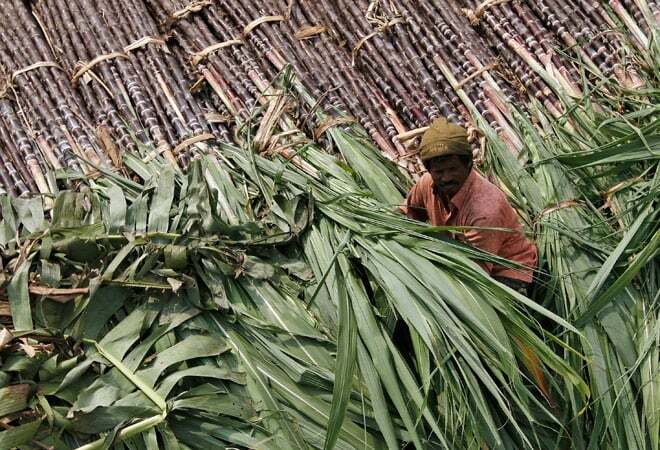 That is why several investors booked profit in July and August after the country's biggest sugarcane producing state, Uttar Pradesh, said it was not ready to accept the Rangarajan Committee's recommendations. The mills, on their part, found the state-advised price for sugarcane too high and said crushing would be unprofitable at such a high price. The standoff has intensified and the mills are in no mood to crush cane. Sugar stocks fell nearly 21% during these months. S Ranganathan, head of research, LKP Securities, says, "It makes little sense to invest in the sector as the mills will find it difficult to crush cane if their losses keep mounting. They cannot pay farmers Rs 280 per quintal, the price that has been fixed by the state." States have the power to fix cane prices above the fair and remunerative price, or FRP, fixed by the Centre. The FRP for 2013-14 is Rs 210 per quintal. However, Vinay Kumar Agrawal, equity research analyst, WealthRays Securities, says, "Clear policies on imports will drive market sentiment and encourage traders to buy." Market analysts say among sugar companies, DCM Shriram Industries, KCP Sugar & Industries Corporation and Andhra Sugars can give good returns in the next 12-24 months. In the second half of August, the government increased the import duty on sugar from 15% to 25%. The aim was to support the mills by ensuring lower imports and rise in demand for the local produce. But this may not help the mills much. Arun Thukral, managing director and chief executive officer, Axis Securities, says, "Normally, this would have benefitted sugar companies directly. Since the mills have to pay huge dues to farmers, this will benefit them indirectly by lowering the working capital requirement." The raw sugar export subsidy of Rs 3.30 per kg will also encourage companies to export more so that they can clear farmers' dues. Most sugar companies, especially those with a big presence in Uttar Pradesh, are under severe financial strain. Many are on the verge of seeking debt restructuring. Some have already done so. In June, banks had given over Rs 4,000 crore as interest-free loans to the mills to clear farmers' arrears. The total amount approved by the government for this is Rs 6,600 crore. "While these interest-free loans will help the beleaguered industry, we believe that the impact will be marginal at best unless radical policy reforms are carried out," says Dhawan of Equentis Capital. Gandhi of IIFL Holdings seconds Dhawan. "Bank loans were given to clear farmers' dues. Higher import duty will support prices in the domestic market but we do not expect any meaningful impact on stock prices." The sugar industry is tightly controlled by the government. Its main problem is the consistent increase in sugarcane prices, which are set by the government, and subdued sugar prices for years now. This has pushed most companies in the red. According to the Indian Sugar Mills Association, the FRP of sugarcane rose 50.9% from Rs 139.12 per quintal in 2010-11 to Rs 210 per quintal in 2013-14. However, sugar prices fell 21% from Rs 3,765 per quintal in January 2010 to Rs 2,962 per quintal in August 2014. Lower margins have made companies heavily dependent on debt. In 2013-14, the debt-to-equity ratios of Parrys Sugar Industries, Ravalgaon Sugar Farm, Bajaj Hindusthan, EID Parry (India) and Triveni Engineering & Industries were 19.19, 5.03, 2.46, 1.55 and 1.48, respectively. Any figure above one is considered risky. If you want to invest in sugar stocks, you should ignore companies that have too much debt and operate in regions where political risk is high. Uttar Pradesh, for instance, is known for effecting steep increases in cane prices to please farmers. "Sugar stocks are extremely volatile and cyclical. For now we will wait for cane pricing issues to be sorted out before investing." says Gandhi of IIFL Holdings. Government policies should also be tracked. Any sharp rise in sugar prices is not looked at favourably by governments due to its impact on the common man. The bottom line of sugar companies was under severe pressure in 2013-14. Uttam Sugar, Rajshree Sugars & Chemicals, Dhampur Sugar Mills and Dharani Sugars & Chemicals registered net losses of Rs 66.94 crore, Rs 34.36 crore, Rs 78.35 and Rs 33.79 crore, respectively. 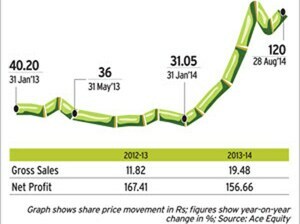 They had made decent profits in 2013-12. "The uncertainty over pricing keeps sugar companies under pressure. Lack of flexibility on pricing does not augur well for them. The recent rise in import duty will improve the business environment. But prices will not rise steeply as the government is keen to check inflation. A small improvement can be seen in the coming quarters," says Thukral of Axis Securities. 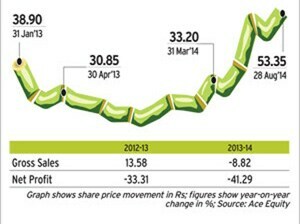 Andhra Sugars is one of the few sugar companies that reported a profit in 2013-14. 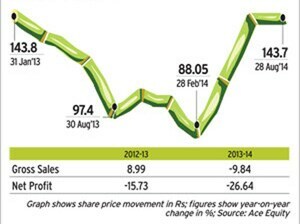 It made a consolidated net profit of Rs 65 crore, down 26% from Rs 89 crore in 2012-13. Vinay Kumar Agrawal, Equity Research Analyst, WealthRays Securities, is bullish on the stock. "This stock could give better returns than others and touch Rs 210-220." One can invest in KCP over a period of 24 months, says S Ranganathan, head of research, LKP Securities. KCP is a diversified business group with interests in heavy engineering, sugar, cement, hydel power, information technology and biotechnology. The company registered a net profit of Rs 49.93 crore in 2013-14, down 41% from Rs 85.04 crore last year. The stock rose 115% in the one year to August 28. "The company produces and sells in Vietnam, where prices are remunerative and cane prices are reasonable due to which operations are very profitable. KCP's 2.5 million tonnes cement plant in Andhra Pradesh is reviving after many years with infrastructure and construction activities picking up in Telangana and Seemandhara. Also, cement prices have risen to Rs 315 per bag from Rs 280 per bag in the last one year. KCP's engineering division is one of the best in the country and will be a key beneficiary of the revival in the investment cycle over the next two years. A trustworthy management and combination of three strong business verticals makes KCP an excellent investment bet for a two-year price target of Rs 150." It was at Rs 56.25 on September 15. It is part of the DCM Shriram group, which makes sugar, alcohol, chemicals, drug intermediates, rayon tyrecord, shipping containers and processed cotton yarn. Half its turnover comes from sugar. The company was established in 1990 after the three-way division of the DCM group. Exports account for 28% sales. Since March, the stock has outpaced benchmark indices and risen over 211%; it was at Rs 120 on August 28. The Sensex rose 27% during the period. According to a report by Sunidhi Securities and Finance, the demand for the company's chemical products continues to remain stable. The good news is that it is focusing on value-added products as well as exports. At Rs 117, the stock is trading at a price-to-equity, or P/E, ratio of 4.2 times 2014-15 estimated earnings and 3.3 times 2015-16 earnings. It can touch Rs 154 in the medium term, according to Sunidhi Securities.